Volvo presents the first heavy-duty truck with electric drive – the Volvo FE Electric. More and more commercial vehicle manufacturers are developing trucks and vans with electric drive. But while many providers are still in the concept phase, others can already deliver. These pioneers now include Volvo. After the medium-sized 16-tonne FL Electric Truck, recently presented by Volvo in Gothenburg, the Volvo FE Electric Truck is now followed by a heavy-duty truck with three axles and a total weight of 27 tonnes. 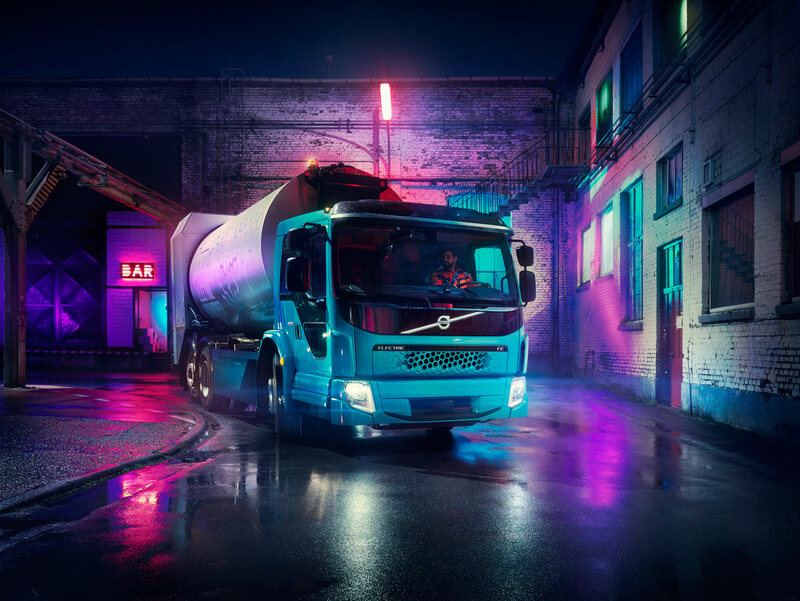 The Volvo FE Electric Truck is now celebrating its world premiere in Hamburg, where it will go into trial operation as a garbage disposal vehicle. In no other application is so often stopped and restarted as in the garbage disposal, where in everyday life sometimes only a few meters are covered to the next stop. Consumption, wear and emissions are correspondingly high. FE Electric Truck with the Rotopress body made by the German manufacturer Faun makes a virtue out of this necessity: Instead of uselessly converting the drive energy into heat during braking, as in a conventional diesel truck, the electric truck can recuperate up to 40 percent of its energy in everyday use. In addition, Faun emphasizes that the Rotopress construction is about one ton lighter than comparable systems and thus provides more scope for the weighty batteries. The Volvo FE Electric Truck shows how modular electric drives can be built especially in the commercial vehicle sector. Depending on the user profile, different battery sizes from 100 to 300 kWh of storage capacity can be installed. The modules are grouped into units with a capacity of 50 kWh each and are attached to the truck frame. One of the lithium-ion battery packs weighs 520 kilos each. Volvo has combined two electric motors from the lighter FL Electric Truck into a double unit. They are connected with a newly developed two-stage gearbox. The maximum power of the twin engine is given as 370 kW, the torque is 850 Newton meters. The Volvo FE Electric Truck is designed for a charging power of 22 kW AC to fast charging with 150 kW DC. For complete assembly with 300 kWh battery packs, the normal charge should last for ten hours, the fast charge – for 1.5 hours. It has a 200 km range. FE Electric Truck will take over into everyday operation from 2019.